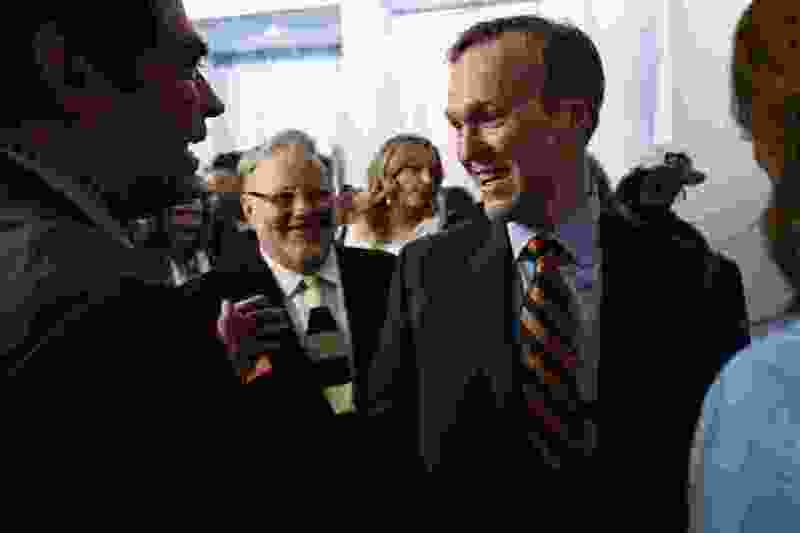 The first day of counting late-arriving ballots — a process that may last up to two weeks — helped Democratic Mayor Ben McAdams slightly build his lead over GOP Rep. Mia Love on Wednesday. Also, the anti-gerrymandering Proposition 4 inched up its precariously thin lead. McAdams now is ahead by 51.45 percent to 48.55 percent, a lead of 2.9 points and 5,414 votes. That is a slight improvement from the 2.78 percent point lead that he had at the end of election night counting. The trouble in the 4th Congressional District race is that no updates have come from Love’s stronghold in heavily Republican Utah County. So the strength of McAdams’ lead remains unclear, still making the race likely too close to call. Scott Hogensen, Utah County chief deputy clerk-auditor, said Wednesday that his county does not plan to post any vote updates until Friday — which may not allow declaring a winner in the race for at least that long. His office reported that 88,910 ballots have yet to be counted there, but is unsure how many are in the 4th District. Meanwhile, Salt Lake County plans on publicly updating its counts daily at 3 p.m. through at least Friday. County Clerk Sherrie Swensen said more than 116,000 ballots in her county have yet to be counted — not including more that still may be in the mail. It is unknown how many of those are in the 4th District. The 4th District contains portions of four counties. McAdams was winning Salt Lake County by 16,336 votes. But he was losing Utah County by 7,030 votes; Juab County by 1,627; and Sanpete County by 2,265. The McAdams campaign said only that he is reviewing those numbers — and may wait for even more results before commenting on his perceived chances of winning. About 85 percent of voters in the district live in the politically mixed Salt Lake County, which contains the bulk of the 4th District’s Democrats. About 11 percent of the district’s registered voters live in Utah County, which tends to vote overwhelmingly Republican. In previous elections, Love has sometimes lost Salt Lake County but still managed to win the race. Hansen said, “From what we’re hearing and seeing, there’s good reason for hope in the Mia Love campaign.” He noted that some people stood in line to vote in Utah County until nearly four hours after polls closed, a positive sign for Love. After updates from Salt Lake County on Wednesday, Prop 4 now leads by a margin of 50.37 percent to 49.62. That is a tiny improvement over final election night counts, when it led by slightly more than a half percentage point: 50.29 percent to 49.71 percent. Prop 4 would create an independent commission to redraw congressional and legislative boundaries after the once-every-10-years Census. It came after years of allegations of gerrymandering by Republican legislators to benefit their party. Prop 4 is winning only in four counties with large numbers of Democrats: Salt Lake, Carbon, Grand and Summit.